Occupying a prime corner in the Lincoln Center district, this 32-story mixed-use building was developed by Christopher M. Jeffries, Philip E. Aarons and H. Lovett and was designed by Gary Handel & Associates and Schuman Lichtenstein Claman & Efron. The building was completed in 1996 and several floors were used as hotel units and above the retail base, which included a major Tower Records, are 200 condominium apartments. Tower Records was a very important addition to the retail base of the Upper West Side but unfortunately in 2008 it closed. The hotel units are known as the Phillips Club and occupy four floors in the building. 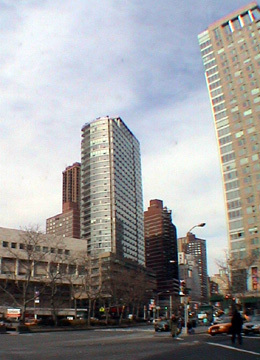 The units are designed for "extended stay" use and proved so successful in the tight hotel market of 1997 in the city that the developers decided to double the number of units to 192 by expanding into the former Chinese Mission to the United Nations Building, a 9-story structure next door on West 66th Street. The developers built a new mission for the Chinese on First Avenue and 35th Street. The building has a slightly curved end facing south the west half of which are balconies, and the tower is set back on a five-story base. The curved, mostly glass south façade has a more modern character to it than most of its neighbors, but the angled base, which conforms to the Broadway street wall, creates an odd tension here. The design relates to nothing in the vicinity although the setback tower at least opens up the congested area to a bit more "light and air." Given its prominent location at the heart of the area's considerable cultural and retail activity, an opportunity to do something dramatic and significant was missed here, but it is still a sleek and handsome project. Some of the units have fireplaces and balconies and all have TV security and intrusion alarms. The building has a doorman and a concierge and there is excellent public transportation. Given its prominent location at the heart of the area's considerable cultural and retail activity, an opportunity to do something dramatic and significant was missed here. Still as part of Millennium Partner's trio of towers here it helped to significantly reinforce the popularity and desirability of this neighborhood, which is one of the city's most successful because of the abundance of good retail, many movie theaters, many restaurants, and many apartment towers, to say nothing of the "culture" available at the Lincoln Center for the Performing Arts and the great comestibles available at the huge Whole Foods store in the basement at the Time Warner Center at Columbus Center.